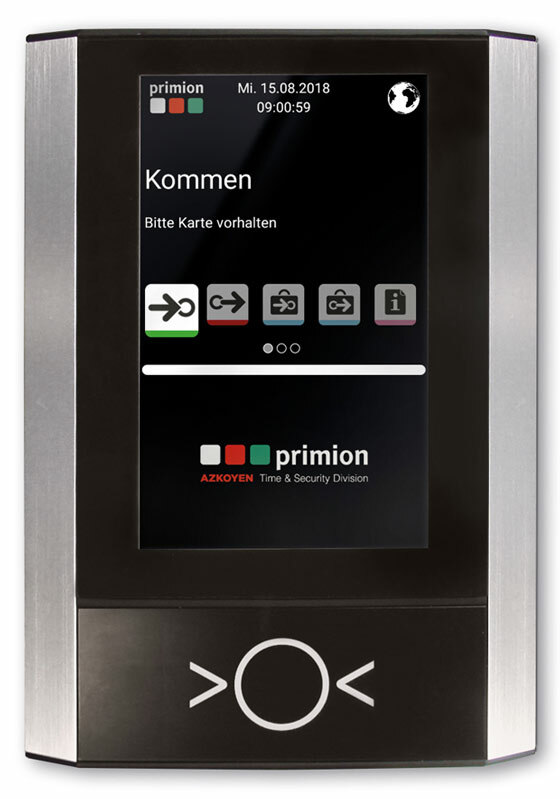 The latest flagship in primion\-\-s product portfolio is the Advanced Data Terminal 1100 (ADT 1100). The modern time recording terminal impresses with its elegant and simple design with a high-quality aluminium frame and has been optically integrated into the current primion design line. The terminal enhances the style of entrance areas and architecturally appealing environments in particular. It convinces through functionality and user friendliness. In the field of reading technology, the latest RFID technologies such as LEGIC advant? and MIFARE? DESFire? EV1 are supported. As an additional feature, the ADT 1100 can take over a pkt master reader function: Access rights for pkt offline components, such as electronic door handles or cylinders, are simply written to the transponder (chip, ID card) when booking on the ADT 1100. The network integration of the ADT data terminals takes place as standard via the integrated Gigabit Ethernet module. This makes the ADT 1110 ideal for new and existing installations where existing equipment needs to be replaced. Depending on the situation on site, the Advanced Data Terminals can be supplied with power either via a low voltage (e.g. 12 V DC) provided by the customer, via an integrated power supply unit (100 – 240 V AC) or simply and conveniently via Power over Ethernet (PoE+). An optional rechargeable battery pack ensures exact data acquisition in the event of a power failure for several hours.